We live in a texting world. The rapid-fire convenience of text messages has steadily shifted communication habits. Just as everyday conversation between friends and family has transitioned increasing away from phone and email in favor of SMS messaging, sales campaigns are making the shift too. It’s not hard to see why with 90% of text messages being read within 3 seconds of delivery. Brevity is key in text marketing. The standard SMS message length is 160 characters and as Twilio explains, you can seriously hurt your promotional campaign by exceeding it: “When you send an SMS message over 160 characters the message will be split. For example, a 161 character message will be sent as two messages, one with 153 characters and the second with 8 characters.” If your promotion is divided across multiple messages, you’re figuratively (and somewhat literally) cutting your odds of landing the sale in half. The concise nature of text messaging is its appeal. Short messages sent and received quickly and easily. A successful text campaign should reduce potential friction points by establishing keyword CTAs: single word replies that opt the recipient into the promotion. For example, a cycling group class discount could be claimed by replying “SPIN” or 10 sessions of PT purchased by replying “10PACK”. Fight the dreaded plague of mass marketing: impersonal messaging. Insert merge tags into your promotional messages to personalize every text sent. Merge tags are placeholders for values that change depending on the recipient like their first name, their city of residence, or their membership ID. When the text campaign is sent, the merge tags pull in the corresponding data for each recipient. Texts that are written as “0, catch our best membership rate of the year” become “Ashley, catch our best membership rate of the year” or “Michael, catch our best membership rate of the year” once sent. Not every promotion is right for every prospect or member of your gym or studio. Boost your close rates by targeting the right audience for your promotions. Segmentation is the practice of dividing your audience by important factors with the goal of isolating the perfect pool of buyers for the promotion you’re running. Audiences can be segmented by age range, gender, membership status, their stage in the sales process, and so much more. By and large, the average American keeps their smartphone close at hand. This likely attributes to the 98% open rate of text messages. However, this is both an opportunity and a risk. You never want to send a text campaign at an inappropriate hour of the day. Can you imagine being deep and blissfully asleep when the silence is obnoxiously broken by the DING! of a text message from your gym or studio? Best practice is to keep text campaigns confined to normal business hours to avoid angry recipients and a sharp uptick in opt outs. Compliance is key! Text message is a highly effective marketing tool but due to its relatively new emergence in sales, there is still some legal gray area around its use. 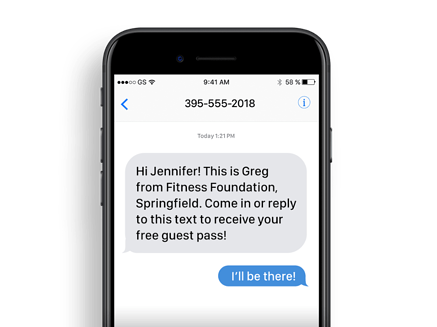 Several high-profile fitness franchises have recently been named in class action lawsuits regarding text communication practices. Mitigate your risk and ensure your text campaigns feature opt-in and opt-out functionality with each text. Running your text campaigns through CRM software that enables recipients to reply “STOP” to opt-out of future text communication is vital to protect your business and respect your prospect and members’ privacy. Read our Text Message Compliance blog for more tips on protecting your gym or studio! Ready to use text for prospecting but not sure what to say? Check out our Gym Sales Scripts e-book for ready-to-use follow-up scripts!